"Mogador" and "Mogadore" redirect here. For the hamlet in Surrey, see Mogador, Surrey. For the village in Ohio, see Mogadore, Ohio. For the class of French destroyer, see Mogador-class destroyer. Essaouira (Arabic: الصويرة‎; Berber languages: ⵎⵓⴳⴰⴹⵓⵔ, Mugadur), formerly known as Mogador, is a city in the western Moroccan economic region of Marrakesh-Safi, on the Atlantic coast. The name of the city is usually spelled Essaouira in Latin script, and الصويرة in Arabic script. Both spellings represent its name in Moroccan Arabic, ṣ-Ṣwiṛa. This is the diminutive (with definite article) of the noun ṣuṛ which means "wall (as round a yard, city), rampart". The pronunciation with pharyngealized /ṣ/ and /ṛ/ is a typically Moroccan development. In Classical Arabic, the noun is sūr (with plain /s/ and /r/), diminutive suwayrah. Hence, the spelling of the name in Arabic script according to the classical pronunciation is السويرة al-Suwayrah (with sīn not ṣād). In the Berber language, which is spoken by a sizeable proportion of the city's inhabitants, it is called "Taṣṣort", meaning 'the small fortress'. 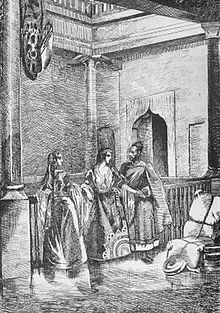 In Moroccan Arabic, a single male inhabitant is called ṣwiṛi, plural ṣwiṛiyin, a single female inhabitant is ṣwiṛiya, plural ṣwiṛiyat. In the Berber language, a single male inhabitant is U-Taṣṣort, plural: Ayt Taṣṣuṛt, a single female inhabitant is Ult Taṣṣort, plural 'Ist Taṣṣort. Until the 1960s, Essaouira was generally known by its Portuguese name, Mogador. This name is probably a corruption of the older Berber name Amaqdūl, which is mentioned by the 11th-century geographer al-Bakrī. Essaouira has long been considered as one of the best anchorages of the Moroccan coast. The Carthaginian navigator Hanno visited in the 5th century BC and established the trading post of Arambys. Around the end of the 1st century BCE or early 1st century CE, the Berber king Juba II established a Tyrian purple factory, processing the murex and purpura shells found in the intertidal rocks at Essaouira and the Iles Purpuraires. This dye colored the purple stripe in the togas worn by the Senators of Imperial Rome. A Roman villa was excavated on Mogador island. A Roman vase was found as well as coinage from the 3rd century CE. Most of the artifacts are now visible in the Sidi Mohammed ben Abdallah Museum and the Rabat Archaeological Museum. Phoenician plate with red slip, 7th century BCE, excavated in Mogador island, Essaouira. Sidi Mohammed ben Abdallah Museum. Betica amphora found in Essaouira, 1-2nd century CE. Aegean amphora found in Essaouira, 3-4th century CE. Resting place of Sidi Mogdoul in Essaouira. In 1506, the king of Portugal, D. Manuel I, ordered a fortress to be built there, named Castelo Real de Mogador. Altogether, the Portuguese are documented to have seized six Moroccan towns and built six stand-alone fortresses on the Moroccan Atlantic coast, between the river Loukos in the north and the river of Sous in the south. Four of them only had a short duration: Graciosa (1489), São João da Mamora (1515), Castelo Real of Mogador (1506–10) and Aguz (1520–25). Two became permanent urban settlements: Santa Cruz do Cabo de Gué (modern Agadir, founded in 1505–06), and Mazagan, founded in 1514–17. Following the 1541 Fall of Agadir, the Portuguese had to abandon most of their settlements between 1541 and 1550, although they were able to keep Ceuta, Tangier and Mazagan. The Portuguese-built Castelo Real of Mogador was defended under Abd el-Malek II by a garrison of 100 Moroccans. It was drawn by Adriaen Matham in 1641. During the 16th century, powers including Spain, England, the Netherlands and France tried in vain to conquer the locality. Essaouira remained a haven for the export of sugar and molasses and as an anchorage for pirates. He departed for Salé on 20 July 1629 with a fleet composed of the ships Licorne, Saint-Louis, Griffon, Catherine, Hambourg, Sainte-Anne, Saint-Jean. He bombarded the city the Salé, destroyed three corsair ships, and then sent the Griffon under Captain Treillebois to Mogador. The men of Razilly saw the fortress of Castelo Real in Mogador and landed 100 men with wood and supplies on Mogador island, with the agreement of Richelieu. After a few days, however, the Griffon reembarked the colonists and departed to rejoin the fleet in Salé. Map of Essaouira by Théodore Cornut. When he left in 1767, areas in pink were already built (streets are still recognizable); areas in yellow (harbour front and medina) were only projected. Harbour fortifications were built by an English renegade named Ahmed El Alj in 1770, as described in the sculptured inscription in Arabic (right). The present city of Essaouira was built during the mid-eighteenth century by the Moroccan King. Mohammed III tried to reorient his kingdom toward the Atlantic for increased exchanges with European powers, choosing Mogador as his key location. One of his objectives was to establish a harbour at the closest possible point to Marrakesh. The other was to cut off trade from Agadir in the south, which had been favouring a political rival of Mohammed III, and the inhabitants of Agadir were forced to relocate to Essaouira. Thédore Cornut designed and built the city itself, particularly the Kasbah area, corresponding to the royal quarters and the buildings for Christian merchants and diplomats. Other parts were built by other architects, including Moroccan architects especially from Fez Marrakesh and Rabat. The harbour entrance, with the "Porte de la Marine", was built by an English renegade by the names of Ahmed el Inglizi ("Ahmed the English") or Ahmed El Alj ("Ahmed the Renegade"). Mohammed III took numerous steps to encourage the development of Essaouira: the harbour of Agadir to the south was closed off in 1767, so that southern trade should be redirected through Essaouira. 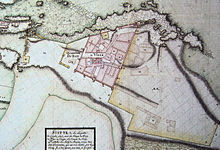 European communities in the northern harbour of Rabat-Salé were ordered to move to Essaouira through an ordinance of 21 January 1765. From the time of its rebuilding by Muhammad III until the end of the nineteenth century, Essaouira served as Morocco's principal port, offering the goods of the caravan trade to the world. The route brought goods from sub-Saharan Africa to Timbuktu, then through the desert and over the Atlas mountains to Marrakesh. The road from Marrakesh to Essaouira is a straight line, explaining the king's choice of this port among the many that the Moroccan coast offers. The ramparts from the Medina. The Genoese-built citadel by the harbour. Dutch cannon made by Adrianus Crans in The Hague in 1744, installed in Essaouira. A Jewish house in Mogador, by Darondeau (1807–1841). Mohammed III encouraged Moroccan Jews to settle in the town and handle the trade with Europe. Jews once comprised 40% of the population, and the Jewish quarter (or mellah) contains many old synagogues. The town also has a large Jewish cemetery. The city flourished until the caravan trade died, superseded by direct European shipping trade with sub-Saharan Africa. Changes in trade, the founding of Israel and resulting wars with Arab states, and the independence of Morocco all resulted in Sephardic Jews leaving the country. As of 2017, Essaouira had only three Jewish inhabitants. Old Jewish quarter in Essaouira. In the 19th century, Essaouira became the first seaport of Morocco, with trade volumes about double those of Rabat. The city functioned as the harbour for Marrakesh, as it was only a few days from the inland city. Diplomatic and trade representations were established by European powers in Essouira. In the 1820s, European diplomats were concentrated in either Tangier or Essaouira. Remains of the 19th-century Dutch Consulate in Essaouira. Remains of the 19th-century Portuguese Consulate in Essaouira. Former French Consulate in Essaouira. The attack of Mogador by the French fleet in August 1844, Serkis Diranian. Following Morocco's alliance with Algeria's Abd-El-Kader against France, Essaouira was bombarded and briefly occupied by the French Navy under the Prince de Joinville on 16 August 1844, in the Bombardment of Mogador, an important battle of the First Franco-Moroccan War. From 1912 to 1956, Essaouira was part of the French protectorate of Morocco. Mogador was used as a base for a military expedition against Dar Anflous, when 8,000 French troops were located outside the city under the orders of Generals Franchet d'Esperey and Brulard. The Kasbah of Dar Anflous was taken on 25 January 1913. In 1930, brothers, Michel and Jean Vieuchange used Essaouira as a base before Michel set off into the Western Sahara to try to find Smara. In the early 1950s film director and actor Orson Welles stayed at the Hotel des Iles just south of the town walls during the filming of his 1952 classic version of "Othello" which contains several memorable scenes shot in the labyrinthine streets and alleyways of the medina. Legend has it that during Welles' sojourn in the town he met Winston Churchill, another guest at the Hotel des Iles. 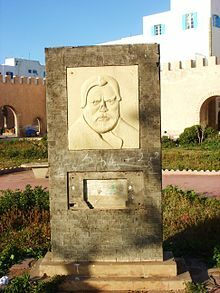 A bas-relief of Orson Welles is located in a small square just outside the medina walls close to the sea. Several other film directors have utilised Essaouira's photogenic and atmospheric qualities. Beginning in the late 1960s, Essaouira became something of a hippie hangout. Iles Purpuraires, with Mogador island in the background seen from the ramparts of Essaouira. 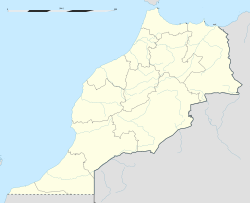 Essaouira connects to Safi to the north and to Agadir to the south via the N1 road and to Marrakech to the east via the R 207 road. There is a small airport some 7 to 8 km (4 to 5 mi) away from the town, which schedules several flights a week to Paris-Orly, London-Luton and Brussels-South (Charleroi) and daily to Casablanca. The desert road between Marrakesh and Essaouira. Essaouira's climate is semi-arid (BSk) bordering a warm summer Mediterranean one (Csb) with mild temperatures year round. The gap between highs and lows is small and summers are warm while winters are mild. Annual rainfall is usually 300 to 500 millimetres (12 to 20 in). Essaouira's climate is akin to coastal Los Angeles, specifically Santa Monica in California. The Medina of Essaouira (formerly "Mogador") is a UNESCO World Heritage listed city, an example of a late 18th-century fortified town, as transferred to North Africa by European colonists. There are only a handful of modern purpose-built hotels within the walls of the old city. Newer international hotels have been built along the sea front – the local planning regulations restrict buildings to 4 storeys high to help preserve the stunning views. There are also many privately owned riads, also known as dars, that may be rented on a daily or weekly basis. Essaouira is also renowned for its kitesurfing and windsurfing, with the powerful trade wind blowing almost constantly onto the protected, almost waveless, bay. Several world-class clubs rent top-notch material on a weekly basis. The township of Sidi Kaouki is located 25 km south of Essaouira and is becoming one of the best locations in Morocco for surfing, windsurfing and kitesurfing. There are several businesses in Sidi Kaouki which offer gear rental. Essaouira is also a center of argan oil production. It has become a tourist attraction due to the tree-climbing goats who are unique to the region, as argan trees are the only type the goats climb. Former Franco-Moroccan school in Derb Dharb street, Essaouira. 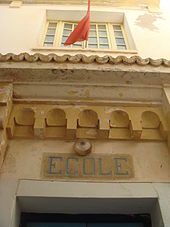 There is a French international school in Essaouira, Groupe scolaire Eric-Tabarly. Essaouira presents itself as a city full of culture: several small art galleries are found all over the town. 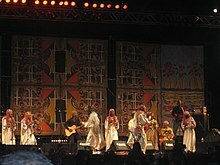 Since 1998, the Gnaoua Festival of World Music is held in Essaouira, normally in the last week of June. It brings together artists from all over the world. Although focussed on gnaoua music, it includes rock, jazz and reggae. Dubbed as the "Moroccan Woodstock" it lasts four days and attracts annually around 450,000 spectators. Victor Elmaleh, businessman and national champion handball and squash player. ^ On the formation of diminutive nouns in Moroccan Arabic, see R.S. Harrell, A short reference grammar of Moroccan Arabic (Washington, D.C., 1962), p. 81. ^ See T. Fox and M. Abu-Talib, A Dictionary of Moroccan Arabic (Washington, D.C., 1966), p. 148. ^ The form sūr, with plain /s/, is the only form cited in all dictionaries of Classical Arabic. ^ Goldberg, Harvey E. (1996). Sephardi and Middle Eastern Jewries: History and Culture in the Modern Era. Indiana University Press. ISBN 0253210410. ^ "Morocco's little idyll of Jewish-Muslim coexistence". The Economist. 2 November 2017. ^ "Essaouira Climate Normals 1961–1990". National Oceanic and Atmospheric Administration. Retrieved 26 January 2016. ^ "Klimatafel von Essaouira (Mogador) / Marokko" (PDF). Baseline climate means (1961–1990) from stations all over the world (in German). Deutscher Wetterdienst. Retrieved 26 January 2016. ^ Planet, Lonely. "Sidi Kaouki, Morocco – Lonely Planet". Lonely Planet. Retrieved 13 October 2016. ^ "Essaouira: Home of the Argan Tree, Hardworking Berber Women, and Amusing Goats". Essence of Argan. Retrieved 18 December 2016. ^ "Groupe scolaire Eric-Tabarly – OSUI." AEFE. Retrieved on 12 May 2016. "25 rue Princesse Lalla Hasna, Quartier des Dunes, 44000 Essaouira"
^ ""La Rosace du Roi Salomon", nouveau roman de David Bensoussan". Le Mag. 14 November 2011. Archived from the original on 3 July 2015. Retrieved 6 May 2015. ^ "Le judaïsme marocain est "bien vivant"". Atlas. 8 November 2011. Retrieved 6 May 2015. David Bensoussan, Il était une fois le Maroc : témoignages du passé judéo-marocain, éd. du Lys, www.editionsdulys.com, Montréal, 2010 (ISBN 2-922505-14-6); Deuxième édition : www.iuniverse.com, ISBN 978-1-4759-2608-8, 620p. ebook ISBN 978-1-4759-2609-5, Prix Haïm Zafrani de l'Institut universitaire Élie Wiesel, Paris 2012. David Bensoussan, La rosace du roi Salomon, Les Éditions Du Lys,www.editionsdulys.com, 2011, ISBN 978-2-922505-23-8. Wikimedia Commons has media related to Essaouira. Wikivoyage has a travel guide for Essaouira.